Do make sure you keep to the 100 words plus the 3 above and please link back here so that other writers can find us. If you are feeling a bit lost do read ‘What is 100WCGU?’. Leave me a comment below if you are still stuck. Click here to enter your link and view this Linky Tools list. I will move them to this page as soon as possible. What is formal education really about? i finally submitted it – glad and excited!! So, is there any alternative?? This is my first 100-WCGU submission great prompt and stiff competition. I’ll be back! 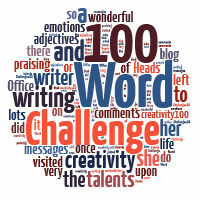 Pingback: 100-Word Challenge: A Deeper Reflection | Even More BonusParts! Hi, Julia and everyone! I’ve just posted my first entry after hearing about your blog and 100 word challenge through Lawrence Simon of the 100 Word Stories Podcast. I’m looking forward to the upcoming challenges! Great texts posted so far! Hugs! Can I add up all the previous prompts and make that my entry! Ah.. This one sounds fun. It’s iambic as well… Thank you.